It has already been one and a half years since The Last Guardian was released in December 2016. Since its release, it has received various accolades at the D.I.C.E. Awards and BAFTA Awards, and won Game of the Year, and now the grand prize in Entertainment at the Japan Media Arts Festival. To commemorate this win, some of the production staff participated in a special symposium on The Last Guardian. We are going to discuss “Projection Trico” on “Special symposium with the staff of The Last Guardian Part.1”. At the award-winning exhibition for the Japan Media Arts Festival, which is to be held between June 13th (Wed) 2018 and the June 24th (Sun), we were able to try out Projection Trico, which was used to promote the game, The Last Guardian. There are some people who don’t know what “Projection Trico” is, and we will discuss what it was originally. Projection Trico is an interactive installation that uses a projector and various sensors. 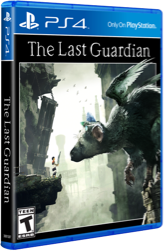 It was shown at game shows around the world in time with the release of The Last Guardian. Trico reacts to spectators standing in front of the screen in real time. 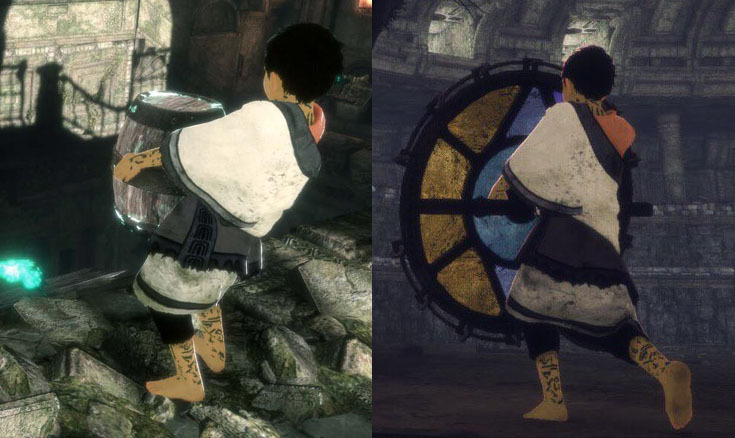 Those who are at the installation can also use items that appear in the game, The Last Guardian, such as barrels and the colored glass with the eye symbol, which will prompt the creature to react in a variety of ways, just as in the main game. For example, if you raise the barrel, you will see Trico come to grab it. You can experience the interaction with a life-sized version of Trico, which moves with AI. Projection Trico's exhibition. Trico reacts to the spectator’s movement with AI. ―Long time no see! Thank you for coming today. We haven't really talked about The Last Guardian like this since we finished working on it, so it's been a year and a half. Ueda That's right, it's been quite a while. Though it feels like just the other day. Tanaka Already a year and a half... It went by in a flash. ―For the last two years, I was working as a genDESIGN staff as a “narrative designer”, working with the screenplay and helping with all kinds of other things, but since I've experienced it from the production floor, I thought we could proceed from a bit of an insider position. Tanaka You two have known each other for a long time, haven't you? ― Yes, I think we first met around 1995. Mr. Ueda and I were both using a 3DCG software called LightWave3D and we each had our own website. At the time, not many people were using Internet yet, so you could count the number of 3DCG designers who were making their own sites on one hand. So back then, most of the 3DCG designers who were using Internet knew each other. Ueda I remember that fondly. ―I think Ico was still in the planning stages then, but at that time, Mr. Ueda was already publishing amazing CG movies and was well-known among LightWave users. *LightWave3D: A 3D software developed by NewTek inc. It's sold by DSTORM, Inc. in Japan. Here is a Fumito Ueda interview by DSTORM, Inc.
Ueda I've heard that you and Mr. Tanaka have worked together in the past, right? ―Yes, we worked together on a CG movie project before Mr. Tanaka joined the Shadow of the Colossus team. I did the modeling, and he added the animation. ―Well, let’s start the discussion. Since Projection Trico will be exhibited at the award-winning exhibition for the Japan Media Arts Festival, let’s start the discussion about Projection Trico before the main discussion about The Last Guardian. How did you come up with the idea for Projection Trico? At that time, you were very busy working on the latest stages of The Last Guardian. Ueda Since we already had a pretty good AI for Trico’s behavior in The Last Guardian, we thought we could create an impressive promotional installation at a low cost by simply using a life-sized version of the creature. The idea was to bring “Trico”from The Last Guardian to a jail cell”. ―”Bringing Trico to a jail cell” does sound like a good way to put it. Ueda Yes. It also means that any updates made to Trico in The Last Guardian would be reflected in the version of Trico in Projection Trico. As a matter of fact, we have originally been creating installations before developing games. So with this work, we wanted to create a performance similar to that of La Machine. *La Machine: A famous French band that performs using machines. One of their most famous works is La Princesse, a 50-foot tall mechanical spider. ―I also got shocked by La Machine. This was the starting point. Ueda At one point, I wondered why people nowadays went to game shows at all, when they could receive information and download game demos at home. It made me think whether we could come up with an exhibit that could be fun and intuitive even to children, who are yet to play games. ―I see. Isn't it quite rare for a development staff to not only come up with such an extensive idea, but also put in so much effort for a promotional project? Ueda I am not sure. I am guessing it is quite rare. A plan for Projection Trico. Includes an illustration by Fumito Ueda. The physical jail was set in his original idea. ―This is an illustration from those days. Ah yes, there was a physical jail at the beginning. Ueda Yes. This was the original idea but I gave it up eventually. The jail was meant to separate the virtual space from the real world. ―By setting it in a cage like we usually see in zoos, you wanted for the visitors to connect it more to reality, right? ―I wanted that version too. This is the reason why there is a CG jail in the final version. ―So, was the first exhibition at the Tokyo Game Show? Tanaka Yes. Tokyo Game Show was our first exhibition. Afterwards, we were at the Taipei Game Show in Taiwan, as well as at PSX and E3 in the United States, totalling 4 events. ―4 times is much more than I had expected. Tanaka At the Tokyo Game Show, which was our first attempt with the project, we had to make Trico react to colors instead of objects like barrels since we did not have enough time for physical objects. But then, that rumour spread (especially the fact that Trico was reacting positively to pink) so from the second day, a lot of people came with pink objects! Actually this made me even more sorry for the delay, so we did our best to incorporate the barrel in our second exhibit. ―Reacting to pink sounds somewhat familiar. Ueda Yes. It’s an homage to the old AIBO series (laughs). ―So the barrel and the colored glass are the exact same objects as those in the game, The Last Guardian. Tanaka That is correct. Part of the reason is to show exactly how they work in The Last Guardian. With the barrel, you can make Trico totally occupied by it, while with the eye symbol, you can make Trico startled and have it growl at you. These are familiar behaviors for those who have already played the game. The barrel and colored glass in the game. ―Since you weren’t sure how it would go, you kept updating it little by little according to the circumstances of the event, right? Ueda Also, we added a reaction that is not present in The Last Guardian. Trico becomes agitated when it sees camera flashes. Just in case some people forgot to turn off their flash while taking pictures (laughs). Tanaka The use of the barrel was made by Tanji-san, right? ―Yes. For example, mechanically speaking, the barrel is fitted with a weight inside which spins when Trico acts on it via Bluetooth in order to provide some kind of physical feedback. Ueda We had some trial and error for that too. At first, we were not sure which motor was the best one to use. We had to purchase and try several and change the weights too. As for Bluetooth connectivity, I think we are using Arduino units. *Arduino: a circuit board system with a micro computer onboard. As an open-source hardware, it is widely used for electronic projects. ―Yes. 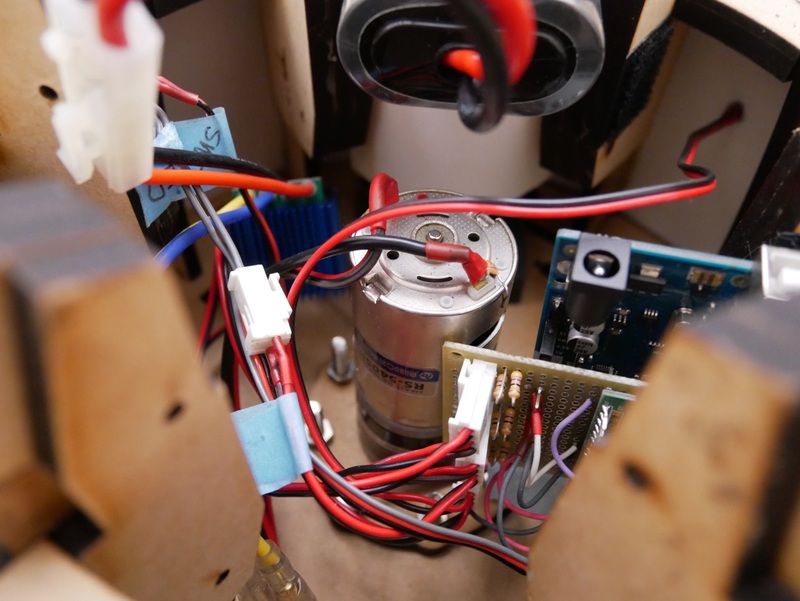 An Arduino unit receives the signal from the PC’s AI, and sends it to the motor. I believe we had several versions of the barrel, though. Why did we need to update those, anyway? Ueda Yes. At first, we had modified a ready-made barrel, which was unfortunately too big for children to hold. Also, we wanted to cover the outer shell with urethane foam, to prevent any injuries. We therefore decided to make one from scratch, and that is also when we determined to incorporate the vibrating function whenever Trico touched it. ―That is right. The new version of the barrel was made with a laser-cut frame using the polygon model from The Last Guardian, with panels added later on. We colored it afterwards with acrylic paint, etc. I believe there are pieces painted by Ueda-san himself. Ueda-san painted it quickly, saying that we should emulate the CG texture. The barrel based on the ingame one. 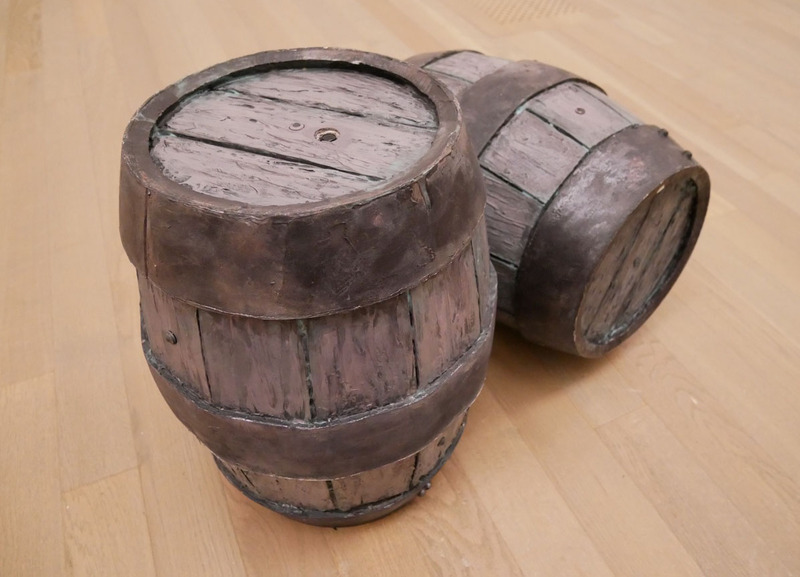 This is one of the barrels painted by Fumito Ueda himself. ―At that time, Ueda-san looked like he was having a lot of fun. Although we were not taking a break, creating something requiring physical work was actually quite refreshing (laughs). Ueda When you make a game for a long time, it’s hard to feel the achievement on a daily basis so it’s fun to create something that you can finish in a short amount of time. Tanaka When we gave the barrel to a visitor to hold, everyone looked surprised. Soon we had people lining up to hold the barrel, and the colored glass. ―That is true. People seemed to love it. It was totally worth the effort. 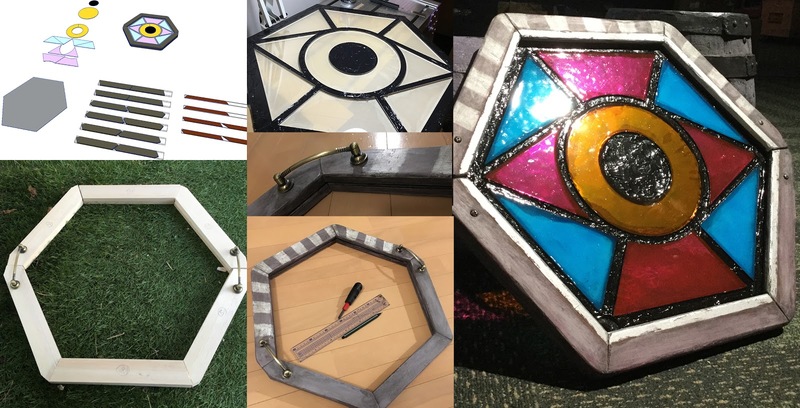 ―For the colored glass with the eye symbol, it was too big to be cut with a laser cutter. When we were wondering what to do, Ueda-san suddenly brought a frame he had created on his own. He showed up to work with pre-cut wooden pieces for the frame, so we quickly pieced them together (laughs) and started mass-producing them with the assembled piece as reference. The colored glass. The frame was designed by Fumito Ueda himself, and the staff mass-produced them based on it. Ueda We embedded acrylic panels into the frame, and colored it using paint mixed with gel medium. It was like going back to my school years. ―To explain how it works, there are infrared sensors on the top of the screen, which sense infrared LEDs embedded into the objects like barrels. Picking up the location of the LEDs, we can make Trico react accordingly in a variety of ways. Finding the position of an object with an infrared camera is a technology often used in interactive art as well. Tanaka Yes. We modified the camera to receive only infrared rays, so we could analyze the footage with it. Ueda I think we had a game designer that had just joined our company, whose first work was making the barrel. ―Was there anything else that you struggled with? Something technical, maybe? Ueda It was not much of a struggle, frankly. But there were several ideas we just could not make happen. For example, we wanted to eventually create a version that focused on a single individual. With just a single person standing in front of the screen, it is possible to determine their position and the location of their eyes, and render the screen to have a deeper sense of depth from that person’s perspective. ―This was halfway finished. But due to the nature of game shows, it was difficult to show the demo individually. Ueda About the combination of barrel and VR, the idea was to use the held barrel to effectively estimate its position in the real world and reproduce it in the same position in the VR world. That way, when Trico would touch the barrel in the VR world, the barrel would shake and you would be able to feel Trico’s existence. ―This is also interesting. It would be similar to an interactive art Ueda-san created in the past. ―It must have been quite the hard work to set it all up. I have heard here and there that you had some problems. I do not know the full details because I was not part of it. How was it overall? Tanaka Well, there were problems in just about any venue. ―Just about any venue, huh? (laughs). I was not aware of that. All I really hear after an event is about how well everything eventually turned out. I am very curious as to what troubles there were. Tanaka Well, the screen was not showing up, and we found that the projector was broken. When we switched it with another projector, it still showed nothing. So we went around to look for a problem besides the projector units, but it turned out that both projectors were broken (laughs). The screen showed up on our third unit. ―That sounds tough (laughs). It must have been extremely difficult to find out what was wrong. Tanaka In another case, the booth across from us had a bright lights shining at Projection Trico’s screen. We had to go and ask them to adjust the angle of the lights. ―Oh, brightness could be an issue when using a projector. By the way, how was it at E3? It is the world’s biggest game show, after all. It must have been pretty intense. Tanaka Actually, it was my first time at E3. And unfortunately, I had to return to Japan after setting up Projection Trico, just before the beginning of the event, because we were close to finishing the development of The Last Guardian. Tanaka I also really wanted to feel the intense air of the event for myself. ―That is very unfortunate, even though you visited E3. By the way, you took the equipments with you on your flight to different venues. I was quite worried whether you would be able to pass customs with something like the barrel. It looks very suspicious, packing a motor and weights inside. As a matter of fact, I waited for a bit after seeing you off at the airport, just in case they stopped you. Tanaka Ah, they did stop me at the customs in the United States. That was pretty scary. Tanaka Yes. They said, “what is in that cardboard box?”. Fortunately there is a staff who is good at speaking English, so we got over this incident. Inside the barrel. Looks very suspicious with all the wiring. 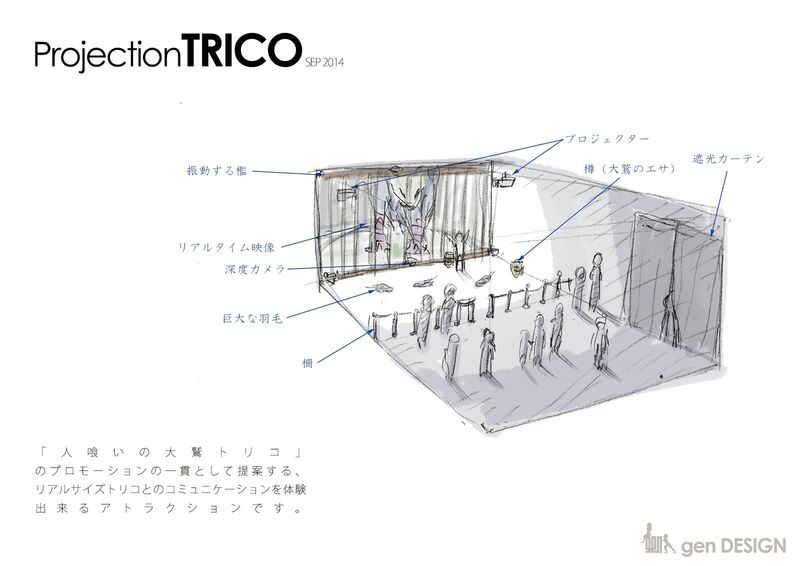 ―And this very Projection Trico can be seen at the upcoming Japan Media Arts Festival, am I right? Tanaka That is correct. Last time at the Tokyo Game Show, not many people knew about the exhibit because it was before the release of The Last Guardian. However, now that the game is out, we expect that people will have a different perspective on the exhibit. Ueda There might be some people who have finished the main game among all the visitors at the exhibit. It would be very emotional for us to have them at the event. ―Being able to interact with a life-sized Trico is quite rare, after all. We hope all of you come and see the creature for yourselves. You can take photos with Trico! Oh, watch out for the flashes which might startle Trico! The 21st Festival received 4,192 entries from 98 countries and regions around the world, demonstrating is continuing evolution as an established annual international festival. Award-winning Works are exhibited both within Japan and abroad through various projects and events organized by The Agency of Cultural Affairs, Government of Japan which aims to develop and promote the creation of Media Arts by focusing primarily on the new generation of artists. The award-winning exhibition for the Japan Media Arts Festival is scheduled to be from June 13th (Wed) 2018 to June 24th (Sun). Come and see Trico for yourself! That concludes the special discussion for Projection Trico. Next time, we will continue to answer questions! Please look forward to the next updates!